First-time submitter Mark D has offered up his 1984 Centurion Turbo for our enjoyment. Let the record show, 1982-1986 is my favorite era of Japanese OTS, and this baby has pretty much all I could ask for. 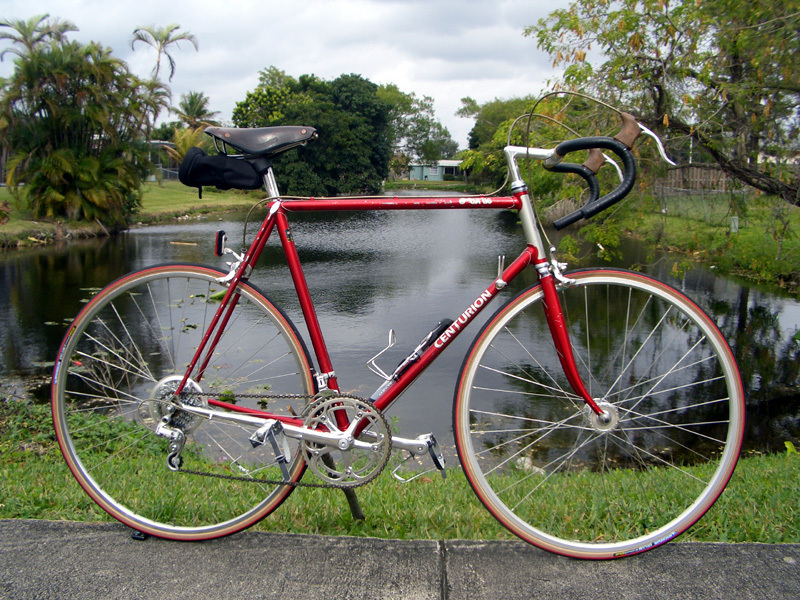 This is my first submission to OTSG, a 1984 Centurion Turbo. 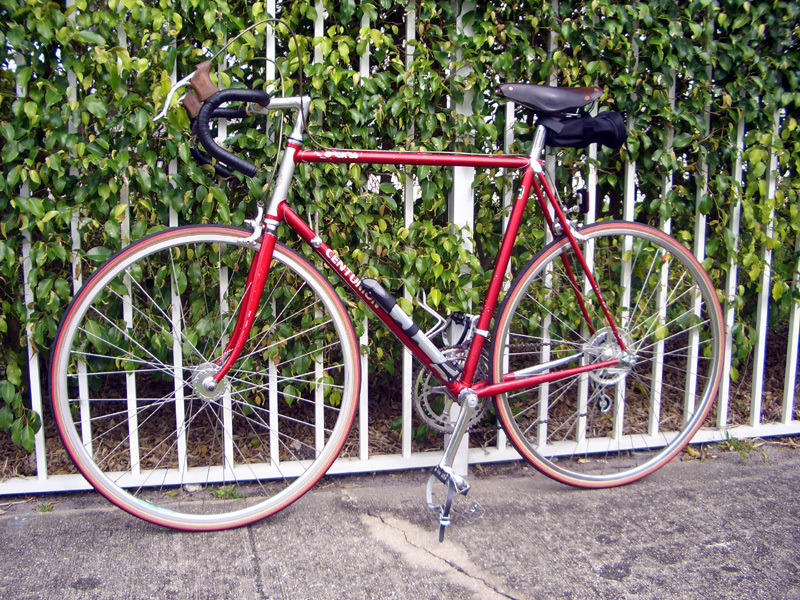 When I got this bike, it was old and crappy, but when it was new, it was anything but crappy. Centurions were made in Japan from about 1970 to 1990. 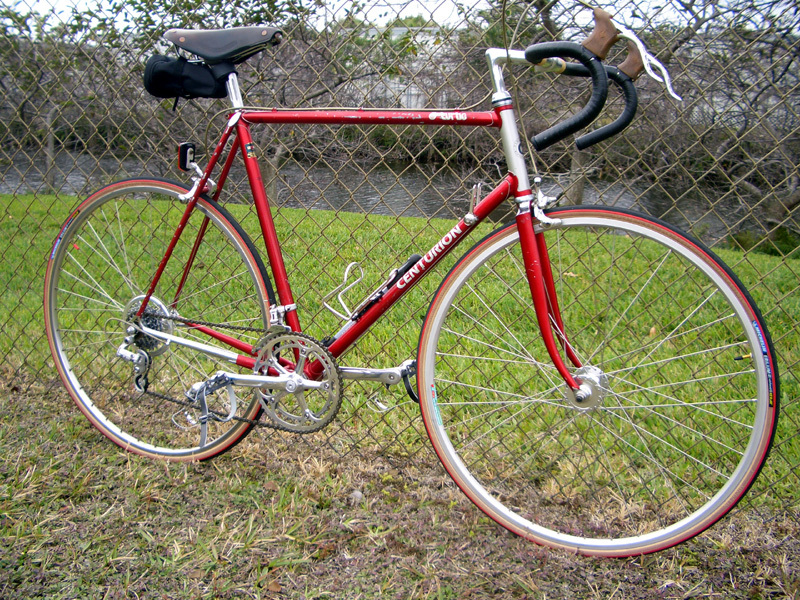 Sheldon Brown (peace be upon him) has the ’84 Centurion catalog online, so I was able to learn that this was Centurion’s top-of-the-line competition model for that year. It would have cost a pretty penny for the time. I found the bike on the List of Craig here in South Florida. The boy who owned it had long ago grown up and moved cross country, so Dad wanted to get it out of the garage. He sold me this bike and a nice 24″ Mongoose mountain bike for $75, so I guess you could say I paid under 50 bucks for it. It was intact, but dirty and in rough shape. I think it had been used as a college get-around-campus beater. I stripped it down to the last bearing ball, cleaned it, and put it back together with new bearings and fresh grease and oil. It was all original, except for the front wheel, which was probably taco’d at some point. I added new tubes, tires, and handlebar tape (I used black cotton hockey tape, cord-wrapped it with some twine, and shellacked it all with clear Zinsser Bulls Eye). 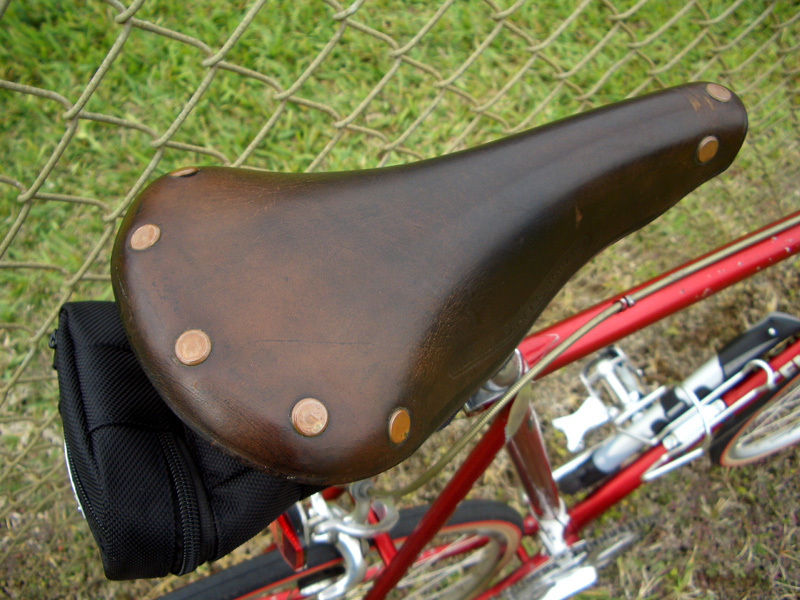 I also replaced the original Selle Italia suede seat, which was falling apart, with the Brooks-like leather seat that came stock on my 1978 Fuji Tourer (I no longer have that bike, but that’s another story) and added some new MKS chrome toe clips, a pump, and a seat bag. The paint has so many chips I didn’t even consider touching it up; I prefer to just think of them as its patina. I had one small cleaning disaster that I’ll relate as a cautionary tale. I bought some cheap “citrus degreaser” at the dollar store (L.A.’s Totally Awesome Orange) and soaked the chainring crank in it. Within a few minutes, the anodizing dissolved and turned a horrible black! The only way to fix it was to spend numerous hours sanding, polishing, and buffing. I even used a bench grinder with a polishing wheel. Naturally, I had to do both cranks to match. 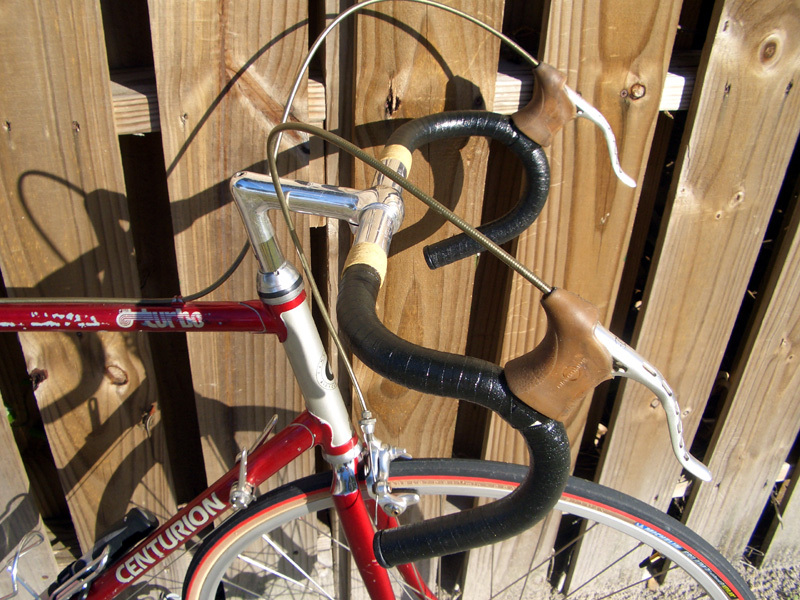 Then I went crazy and did the handlebars and stem as well, so now they all have a brilliant chrome finish. Moral: be careful with degreasers and anodized aluminum. Caveat emptor! This bike was marketed to compete with good Italian bikes of the day, as evidenced by the catalog’s hyperbolic tag line, “Test ride the Turbo. You’ll be saying ‘Ciao’ to the competition.” This also helps explain the brand name Centurion, which is Latin for a type of Roman commanding officer. 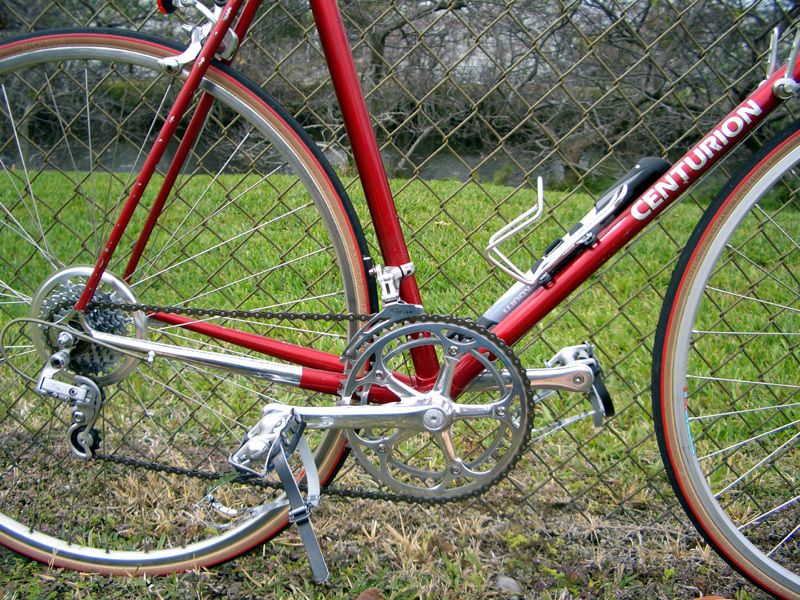 There’s an excellent introduction to Centurion bikes at http://www.sheldonbrown.com/centurion/index.html. Love OTSG! Thanks, Cameron, and all you other cotters. Wow, Very nice……extra nice for all the extra work on the cranks. Great bike! And the polishing is “off the charts” I think the scratches give it character. Scratches are like scars. And you know what they say about scars. I’ll never understand why they stopped turbo-charging bikes. Nice ride! re. the citrus degreaser problem — i’ve discovered that a longish soak in Starbrite’s aluminum cleaner (some sort of acid?) restores nasty blackened aluminum to matt silver, which then easily polishes back to the shiny stuff it was always supposed to be. Super clean. All original hardware.